When you think about London, you immediately reckon the Big Ben, the London Eye, the Queen and, of course, the famous double-deckers. These are some of the major icons related to UK’s capital city. The first double – decker buses were constructed after the World War II and they were ca;;ed AEC Regent III and AEC Regent II. The first red rear – entrance bus in London was called the Routemaster. It was constructed by Park Royal Vehicles and the Associated Equipment Company and its design was signed by London Transport. The first bus was designed in 1954 and it was discontinued in 1968. It soon became known worldwide. These vehicles are still in use, but only for the heritage routes. The Routemaster and the double-deckers in general are world – famous symbols not only for London, but also for the United Kingdom. Even though the original Routemaster was retired, a new and updated service was introduced in early 2012. The first buses in London date from 1829, when the horse drawn omnibus service was introduced by George Shillibeer. It ran from the city to Paddington. The horse bus services started in 1850. The first motor omnibuses were introduced in 1902. On 25 October 1911, London was crossed by the last horse – drawn bus. The bus numbers were introduced in 1906. The buses used in London are slightly different from those used in the rest of the country. Most of them are red and they have a special design. Moreover, the London General Omnibus Company created a subsidiary (the Associated Equipment Company) to design and build buses for London. However, the last bus designed especially for the capital city was the Routemaster, constructed from 1956 till 1968. Since that moment, the buses designed for the local services in London have been inspired from other models used elsewhere. 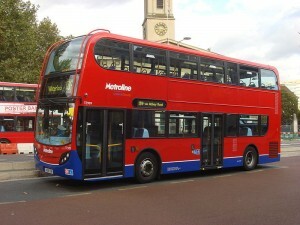 Since 2000, London’s fleet, featuring double-decker buses, was augmented with hybrid buses and articulated buses. The oldest Routemasters are over 50 years old. Moreover, they cannot accept pushchairs and wheelchairs. Because of these aspects, the bus fleet is currently under improvement. New double-decker buses were introduced in 2012. The local buses operate within the London area, but there are also routes serving the outer regions of London. The capital city also features night buses that were introduced in 1913. They are distinguished from the daytime buses through the prefix N added to the number. Most night bus services can be taken from Trafalgar Square and they replace the train and tube routes that are closed during the night. If you are a tourist in London, then you will most certainly want to visit the historic centre of the City with one of the many tour buses. The majority of them are open-top buses so as to allow you to admire the majestic landmarks in UK’s capital city. These buses feature recorded or live commentary regarding the attractions spread along the way. Several stops in Central London are served by the National Express, which offers transfers to the following airports: Stansted, Gatwick and Heathrow. In case you need a more convenient and comfortable way to get to the airport, then you take into consideration hiring a licensed private hire. It is cheaper than the black cabs and faster than the buses. Moreover, it can pick you up from every address in London and take you safely to any of the six airports serving the capital city..